Proceeds from the sale of dessert to benefit the Antoine Bethea Safe Coverage Foundation. World-renowned St. Elmo Steak House will donate $2 from every sale of its Colts Blue & White Bread Pudding to the Antoine Bethea Safe Coverage Foundation from now until the end of the season. This partnership gives Colts fans a great reason to save room for dessert when dining at St. Elmo Steak House. 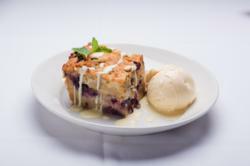 Best known for its shrimp cocktail and steak, this savory dish consists of luscious blueberry white chocolate bread pudding, bourbon cream sauce and ice cream. "I truly appreciate St. Elmo's support of my mission to improve the lives of Indy youth through my foundation's programming,” said Antoine Bethea. “It definitely shows that no amount is too small and that if everyone contributes just a little, we can make a big difference. Plus, you get to enjoy a delicious dessert; it's a win for everyone!" Indianapolis Colts Pro Bowl Safety Antoine Bethea founded the Safe Coverage Foundation in 2010 to provide access and resources for students to achieve their dreams of a higher education. The Safe Coverage Foundation believes that by providing exposure to opportunities, enrichment experiences and the tools needed to succeed; SCF can change communities, one student at a time. same world-class service and some of the same classic dishes including the St. Elmo Shrimp Cocktail.